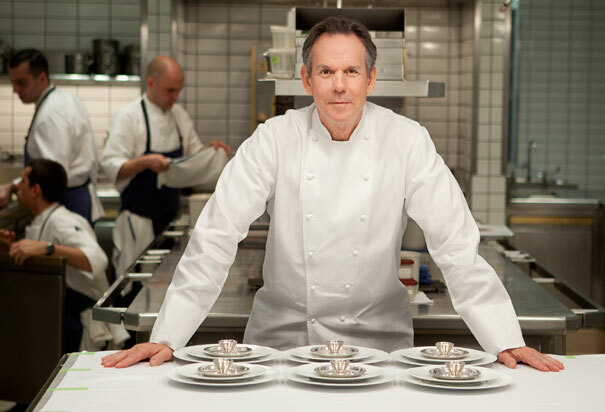 Chef: Thomas Keller is currently perhaps the most cherished chef in North America. His cooking wonders at the French Laundry in Napa Valley brought him a bounty of fans and remarkably enlivened the gastronomy scene in the US. Along with the French Laundry his French bistro Bouchon mushroomed on the east coast, he opened Ad Hoc in Younville, the gastronomical heaven in Napa Valley, and finally in 2004 he opened the most awarded from all of these newcomers – Per Se in New York. Per Se was for most of its existence helmed by Keller. Since the early 2010 Eli Kaimeh, who has been Per Se’s chef for years, took higher responsibilities and has been leading the restaurant’s daily feat for perfection woefully. Per Se is a steady loiterer at the summit of the restaurants’ Everest in the New York city unwilling to climb down. Price: Very expensive (Two daily changing nine-course Chef’s or Vegetable Tasting menus, each $295; five-course lunch menu $185; Salon menu is á la carte starting at $30 per plate so if you are careful you can dine at Per Se just under $100 per head). Salon is the bar area just after entering Per Se. Atmosphere: The entrance to Per Se is located in the New York’s Time Warner Center building highlighting the Western corner of the Central Park. The journey up to the fourth floor, where Per Se resides, seems to be on one side understated as you get there via the shopping mall escalators surrounded by clothing, home ware and other goods staring at you from the shops’ windows. As you get closer though, the pompous massive wooden doors with golden handles assure you that this is not just another mall eatery but a serious dining establishment. Do not be fooled by it and enter the unpretentious mecca of culinary innovation and gustatory pleasure. It does not bite you, but you will surely bite into lots of tasty stuff inside. The Salon is a more elegant name lessening the importance of drinking and emphasising the food at the bar seating area offering a number of dishes from the tasting menu á la carte. 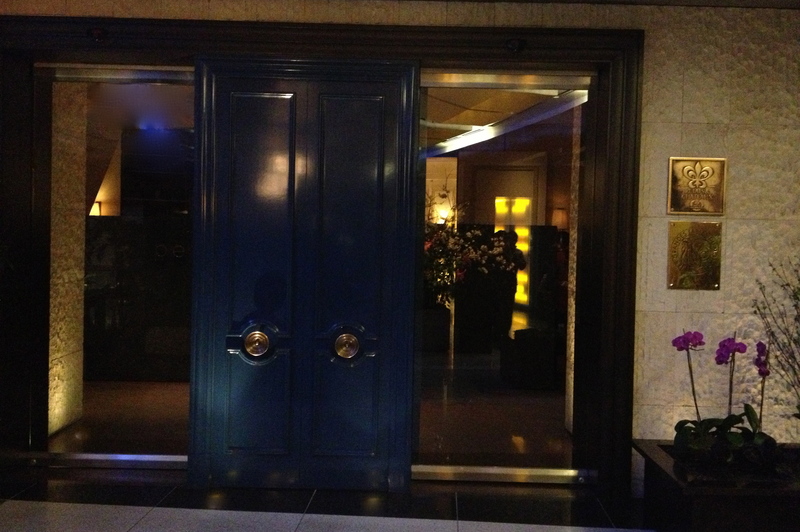 Its interior is darker and perhaps more intimate than the 16 table restaurant. At the Salon there are no reservations accepted like at the bar at other top New York restaurants such as Le Bernardin and Daniel so just show up and dine. A huge advantage considering the fact that the restaurant is usually fully booked the full month ahead from 10am when its booking lines open. Food: Balanced, impeccably sourced and reasonably sized (of you consider all that extra stuff you will be treated by, but you did not order). You will get the famous Amuse Bouche of the Tuna mini cone whether you eat at the bar or the restaurant. It is sublime! The thin cone envelops the foamy tuna mouse melting in your month like a whipped sea wave bringing along multiple of flavours it assembled throughout its journey from the water to the chef’s hands. An almost meditative start to a nice meal. From the menu there is usually at least one vegetarian (vegetable-based) dish. Something in the style of the haute couture of a salad. I tried the Hawaiian Hearts of Peach Palm, which was a wonderfully assembled plate of celery branch, an exotic Cara Cara orange, preserved green tomatoes and horseradish crème fraiche. All the ingredients in this refreshing, zesty and savoury sphere were delicious and light. Foie Gras is a must at gastronomic restaurants using French cooking techniques and Per Se is not an exception. Its ban in some countries and states including the sunny California (home of French Laundry) complicates work of many chefs there, but not in the open-minded New York. You will find daily changing variations of culinary adventures with this mellow yet rich duck liver known in the gastronomy world under its more flattering French name (Foie Gras means the same, yet sounds better). On our menu featured Slow Poached Élevages Périgord Moulard Duck Foie Gras served with poached rhubarb, refreshing young fennel, the crunchy and mild tasting Spanish Marcona almonds, rich greek yogurt and green sprinkle of watercress. Of course you can go with the luxurious caviar, yet that will cost you well over $100. 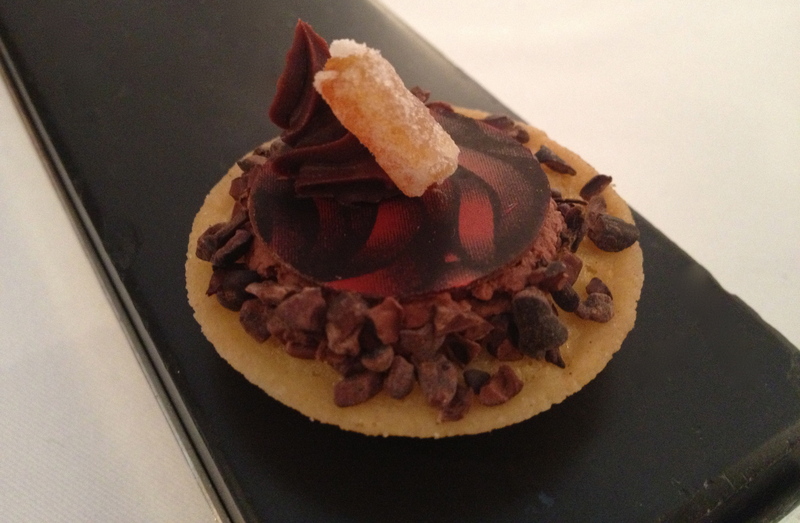 It will be served in style with the Per Se touch. The main dishes were inspired by Italian and French cuisines using local as well as European ingredients. We tried the Mediterranean Turbot served with soft Celery Root “Porridge”, Chestnut Confit, Brown Chicken Jus and Black Winter Truffles. The fish was tender and tasted fresh despite being brought from the Mediterranean. The delicate blend of flavor rich ingredients could always hide the fact that fish probably spent a couple of hours on the plane. Once again a perfectly balanced dish. The Butter Poached Lobster from Nova Scotia served with Toasted Bread Pudding in a shape of a moon on the Turkish flag, Caramelized Cipollini Onions, crunchy Piedmont Hazelnuts, Pumpkin “Parisienne” and Fig-chocolate emulsion, was an international conference of resources and ideas. It was as if the American lobster discussed peacefully with the Turkish-British alliance symbolized by the Bread Pudding how to deal with the Italian and French gastronomic dominance in our restaurants. The Fig-chocolate emulsion solved the issue by balancing the global powers on the plate. The emulsion changed the overall character of the dish so none of the national ingredients prevailed. On the menu was also a Pork Belly from Salmon Creek farm, beef and “Carnaroli Risotto Biologioco” with truffles. The latter translated from Italian simply means “Organic risotto made from Carnaroli rice”, but it sounds fancier in its native language. If you did not have enough, the Dessert Tasting Menu is available at the Salon for $65. Five mini-desserts might be too much for your taste buds. In that case you can still order à la carte. There is also “The Cheese Course” served with tasty amenities or the chef’s speciality “Jaffa Cake” which I went for … hmm … I did not regret while knowing that I will have to spent a good hour of brisk walking the next day to burn it all out. 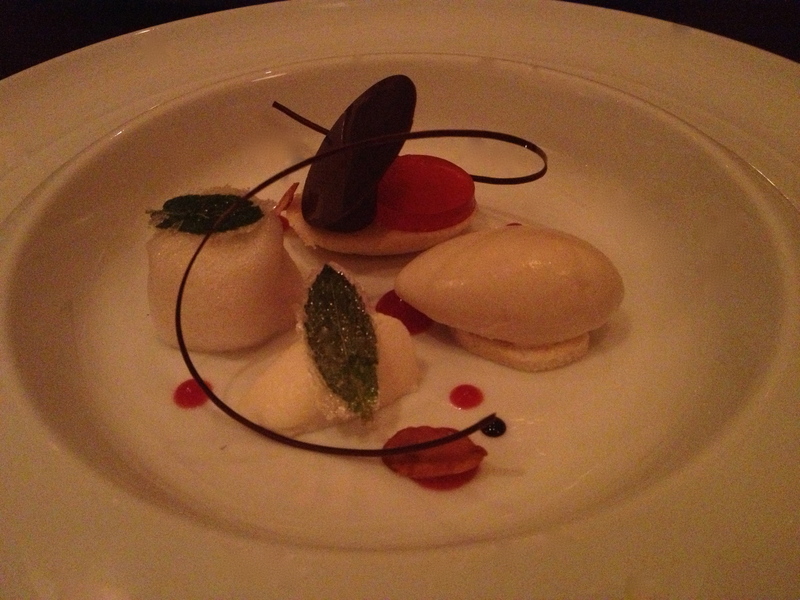 This multiple dessert consisted of a Vanilla “Génoise”, Blood Orange “Pâte de Fruits,” Mast Brothers’ Chocolate “Ganache” and Jasmine Ice Cream. Explanation of all these diligently described building blocks of my dessert might be confusing so I cut it short – it was superb and the picture above shows the complexity of it. 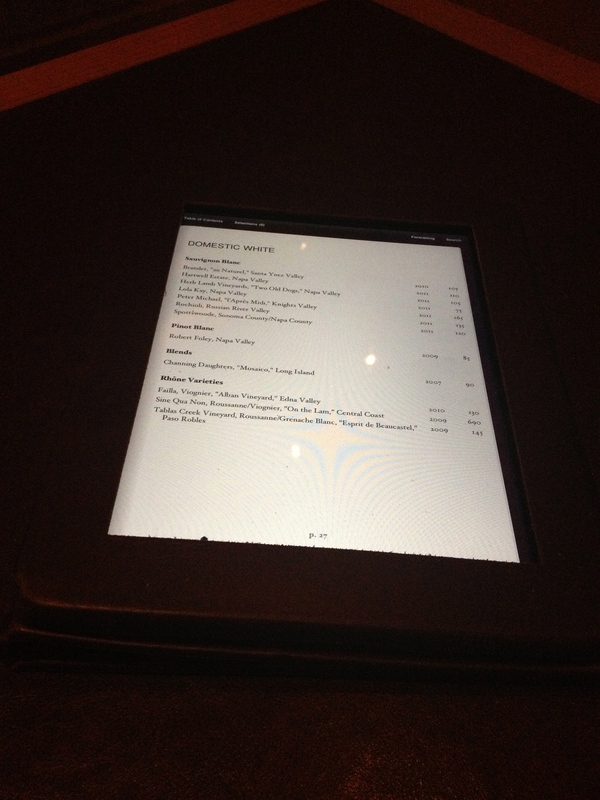 Drinks: The iPad electronic “wine list” enables adding, deleting and expanding the wine selection with a slip of a finger so the sommelier has a total up-to-the-minute control over it. It is well-organized and practical. Nevertheless, if you do not know wine and wine-producing regions well or are like me the old-school paper loving human being, then your first moment of excitement may fizz out in a few seconds. If you are lost just ask the sommelier which glass he would recommend with your dish or which bottle fitting your budget he would suggest and importantly why. There are wines under $100 per bottle so do not worry you will not break a bank here, at least not because of the wines. Cuisine: Gastronomic – mountains meet Provençal fare. 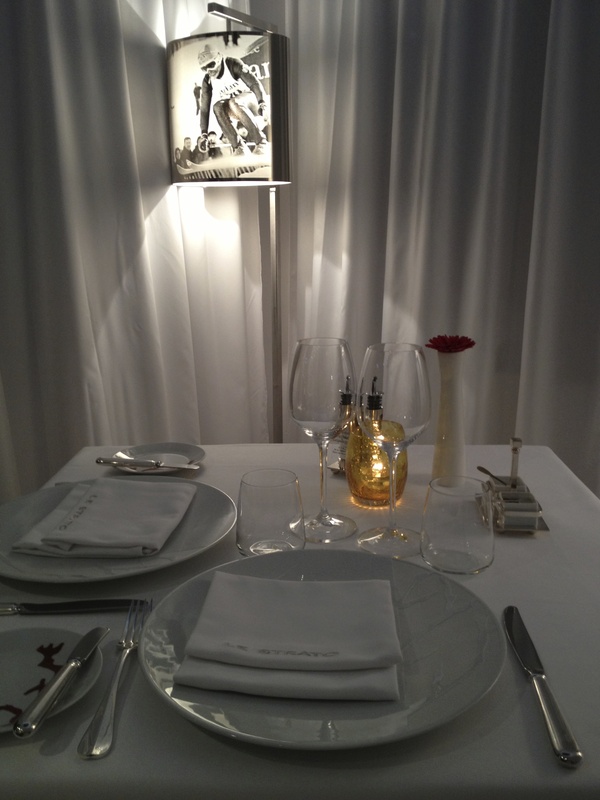 The restaurant received two Michelin stars in 2012. Price: Very expensive (location at a luxurious hotel & two-michelin-stared chef from a legendary restaurant in Provence, both do not come cheap; dishes from €70 up). Chefs: Sylvestre Wahid (cooked at Plaza Athénée in Paris, Alain Ducasse “at the Essex House” in New York) has been cooking at the two-star Relais & Chateaux property L’Oustau de Baumanière in Provence for years before he took charge of the menu at Le Strato. There, together with his talented brother Jonathan Wahid, an award-winning dessert chef, they pamper the palates of skiers and non-skiers alike visiting Courchevel each winter. Using top ingredients and their boundless creativity are the signatures to both brothers thus joining the ranks of top chefs in France. Atmosphere: Modern, stylish, cosy and warm. The interior is fresh and clean while still keeping the cozy feel of a mountain retreat. The two fireplaces in the dining room create a relaxed and warm atmosphere. 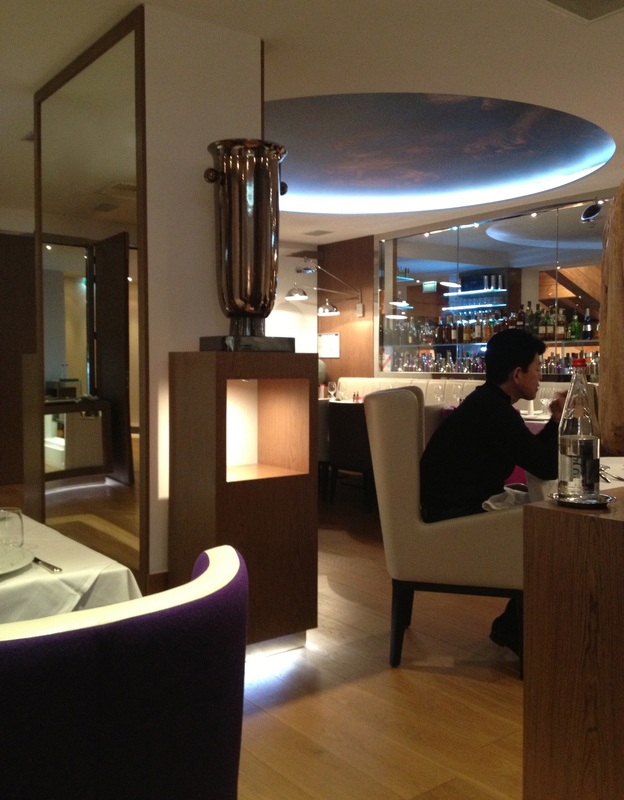 There is also a small bar area, gently separated from the main dining room by a mirrored wall. One can see through the glass wall behind the bar into the hotel main lounge bar. More private tables are secluded from the 360-degrees views of the rest of the diners. Although the hotel is located in the mountains, the gastronomic restaurant is quite formal so do not wear your ski suit and Moon boots. No ties or special dresses needed though. Smart-casual clothes gets it right. Food: Creative, light and superb ingredients. The menu changes on daily and seasonal basis, although most of the chef’s signature dishes tend to be included more often. 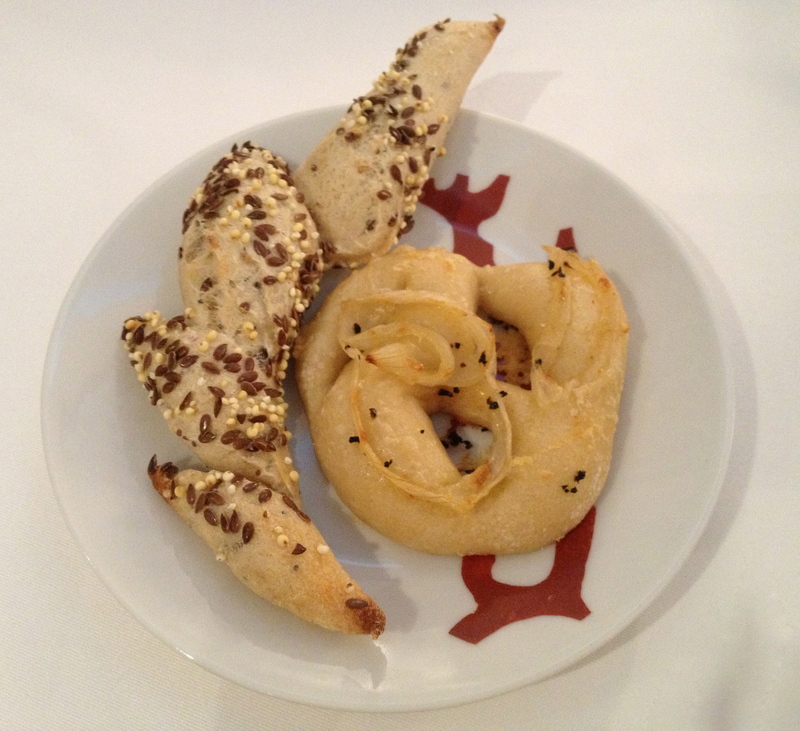 The bread is superb, yet be careful how much you eat since there will be more dishes than those you order from the menu. As at any Michelin-stared restaurants you will get an amuse-bouche before your first course and a small dessert or petits fours after your main course or a dessert. 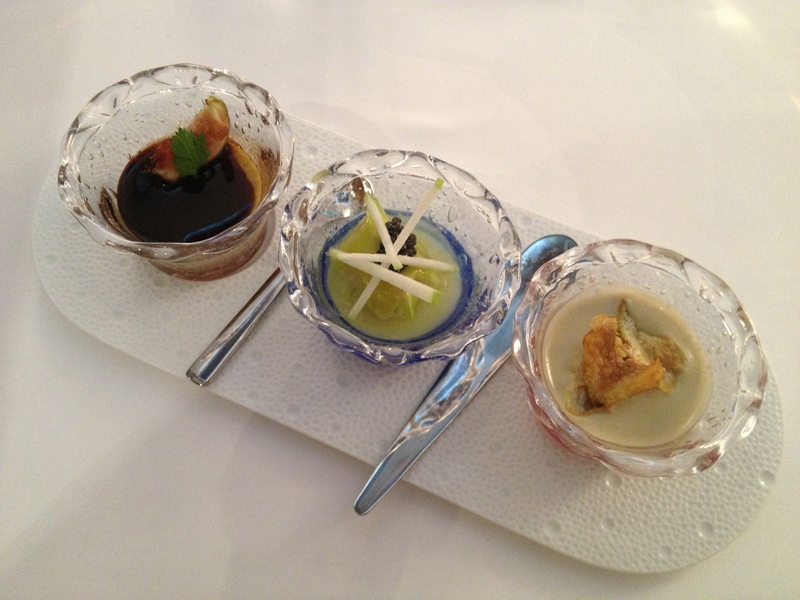 The trio of amuse-bouche served in glass cups whetted our palates for creative and tasty starters. 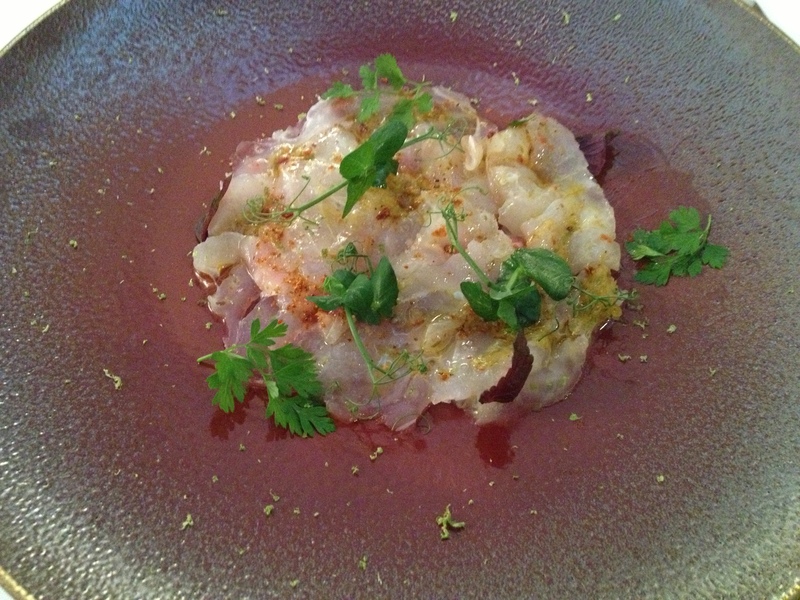 I followed advice of a helpful and professional waiter and started with the Seabass carpaccio. He lured me saying that it was freshly delivered that day straight from the sea. As my highly fish-discernible palate later confirmed, he knew what he was talking about – the fish was tremendous. Melting softly and tasting fresh, abundant with the flavours of the sea and not as fishy-tasting as the less fresh products of the sea often tend to be. The chef’s unique take on foie gras, Alaska snow crab or scallops are also interesting options as an appetizer. The main courses looked in writing so interesting making it hard to decide which one to select. We went for two daily dishes we both liked the most and sampled from each other’s plate. Luckily me and my fiancée were seated at the more secluded table so we did not need to keep up the high dining standards (etiquette) generally expected at gastronomic restaurants. Nibbling from my dining partner’s plate is my penchant and one could say one of my bad habits. Of course I always ask when appropriate, although if it was up to me, I would have just served food at all restaurants in the asian share it all manner. 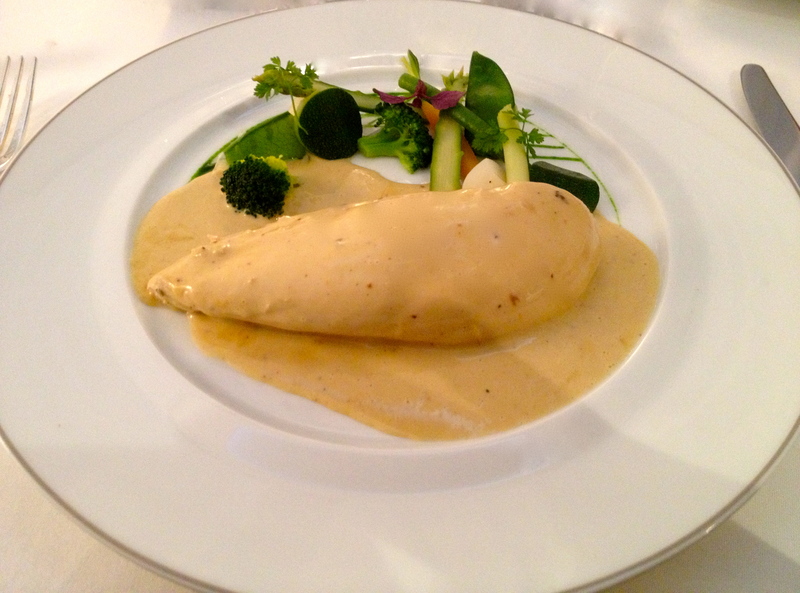 A tender and moist Chicken from Bresse (the legendary French region famous for its superb chickens) was our choice number one. We always remember the tremendous chicken we ate at the three-Michelin-stared restaurant in the village of Vonnas cooked by the chef Georges Blanc, whom we call “the king of chickens”. (Apologies Mr. Blanc if you are reading this, but we mean it as a compliment). 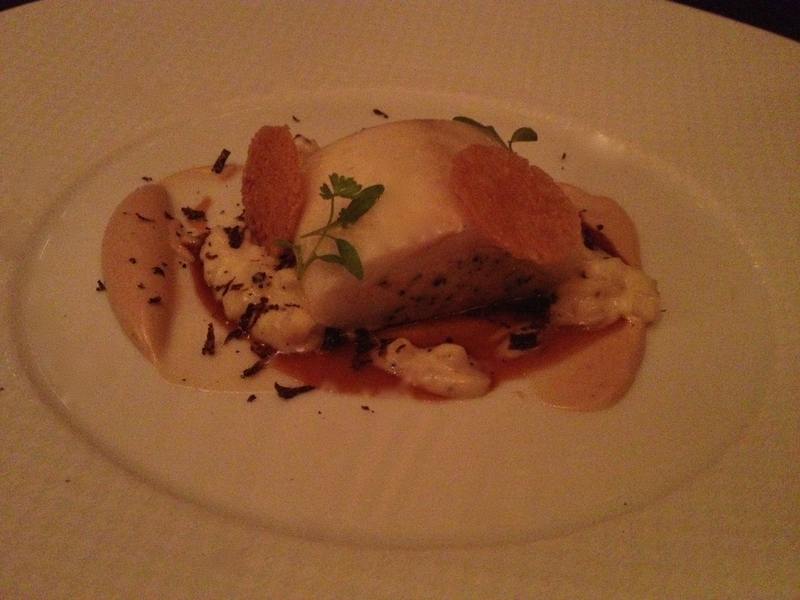 The chicken at Le Strato was not a far from the chef Blanc’s perfection. Cooked to an utmost tenderness, the meat was succulent absorbing the creamy sauce with easy. The resulting duet of flavours was harmonious, jazzed up a bit with crunchy and fresh vegetables served on the side. Even in the main course we went for the fish. 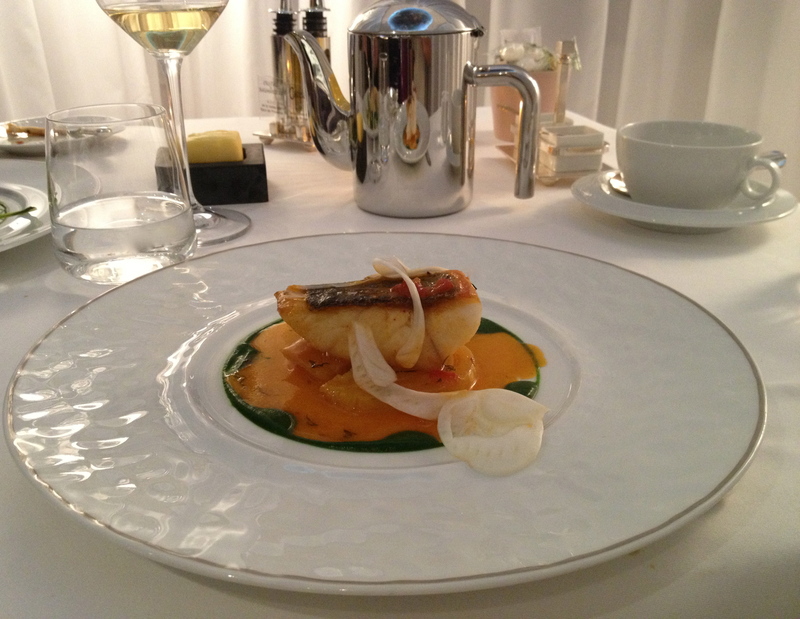 The Sea bass was really a hit on that evening so we enjoyed it in tow versions – raw and cooked. I do not dare to say which one was better, but one thing is sure – they were both excellent. The grilled main course was a perfect harmony of each-other-enhancing ingredients with the delicate fish not being quelled by the creamy tomato sauce, zesty fennel and savoury herb puree. Veal, lamb and other meats feature on the menu as well so serious carnivores will be not cut straight. The desserts are not to be missed. Masterminded by the pastry chef Jonathan Wahid these sweet delicacies can rival even the France’s dessert legend Pierre Herme. Each piece is perfection. From chocolate to innovative take on classic desserts such as the Month Blanc he creates desserts that will be loved even by the less serious sweet lovers. The petit fours are so pretty that one hesitates eating them. The idea of how much perfecting work must have gone into each piece made me appreciating every single bite much more, similarly to relishing the world’s most celebrated artisanal chocolate truffles. Drinks: The wine list fashions the top producers from France as well as a good selection f wines from Provence. Since the restaurant is quite France-centered it makes sense. The wines-by-the-glass were chosen smartly – appealing to most of the palates with high quality attributes. The tea selection is very good as well so if you do not feel like drinking alcohol go for a pot of a warming verveine or a jasmin tea. Address: Le Strato hotel; Route de Bellecôte, 73120, Courchevel 1850, France.